This tutorial will talk about the solution for hard disk resizing when you get low disk space warning message on Windows 2012. Download IM-Magic Partition Resizer Server to redistribute hard disk on Windows Server 2012. It is risk-free and easy to handle. Hard drive is an essential part on a computer. Probably, you didn't think too much when partitioning a hard drive on your computer. However, when you receive low disk space warning message someday, you may feel upset. What can you do when disk partition is running out of disk space on Windows 2012? If you have such kind of doubt, you can use the partition software IM-Magic Partition Resizer Server. This partition software has the ability to resize hard disk without repartitioning or reinstalling, so you can easily reallocate disk space without hurting the operating system or original data. 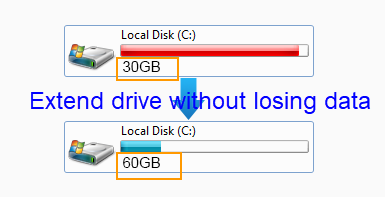 Move the arrows when mouse shows double arrows symbol to shrink some unallocated space from the selected partition. You need to move the unallocated space close to C drive. Right click C drive and select "Resize/Move" option. Move the arrows to add the unallocated space to C drive. Then, you can click "Apply" button to apply all pending changes. "I am looking for a way to extend the space of system partition on Windows Server 2012. I tried to delete some files and uninstall some programs, but system still keeps saying C drive is running on low disk space. So I want to search for a partition tool to increase the size of system partition. Can anybody recommend one?" "I received a low disk space alert message when I was installing a program on C drive on my computer. My computer runs under Windows Server 2012 operating system. Because of the low disk space alert, I didn't install the program on my computer. However, my computer still keeps saying low disk space frequently. How can I fix the low disk space? Can I increase the size of C drive on Windows Server 2012?" In most case, people often feel upset when C drive is running out of disk space because operating system is usually installed on this drive. When a system partition is running on low disk space, people cannot simply delete or move files to free up disk space. Without any partition tool, you may need to repartition hard disk and reinstall system to fix the problem. However, if you can use the partition software, problem can be resolved much easier. The partition software helps increase the size of system partition by moving free space from any of partition which has enough free space on the same hard disk. In addition to C drive system partition, there is at least one logical partition on your computer. Usually, you may store different kinds of data to the partition, so we also regard the partition as data partition. When a data partition is running out of disk space, you can delete unnecessary files to free up disk space. Or you can move some file another to another partition or storage media. However, if you want to reallocate more available space to a data partition on Windows Server 2012, you still need to rely on partition software. By using partition software, you can resize disk without deleting or moving any data. This Windows Server partition software provides safe way to reallocate disk space without losing even a single data. 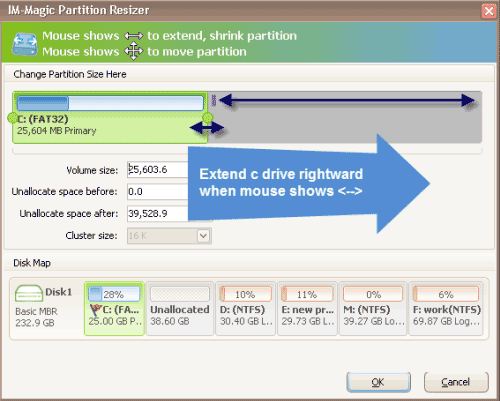 IM-Magic Partition Resizer Server is also able to work on Windows Server 2012 R2 or VMware to redistribute disk space. No matter it is system partition or data partition running out of disk space on Windows Server 2012 R2 or Windows 2012 VMware, you can use this partition software to resize hard disk. This partition software supports NTFS and FAT32 file system. It allows you to resize hard disk without formatting or reinstalling system, so you can reallocate disk space to fix low disk space problem easily and effectively. This partition software enables you to resize hard disk on Windows Server 2012 R2 VMware efficiently without rebooting PC. If your computer reboots due to unknown reasons during partition resizing, the partition software does to have any influence on your computer.